DigiFinex is going to list Zcoin (XZC). 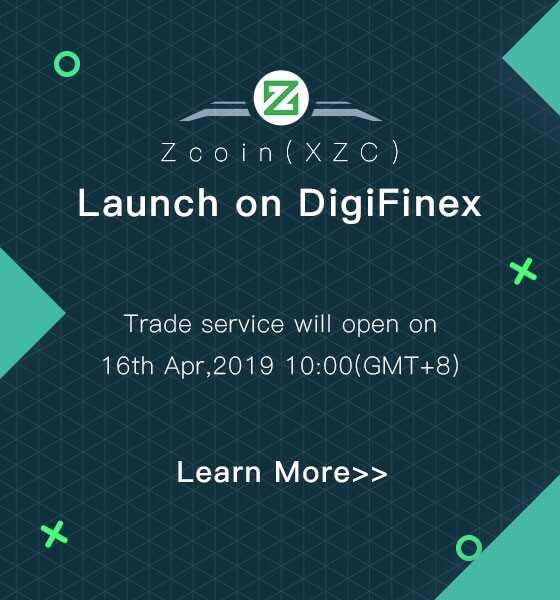 ✦ XZC deposit opens: 15th Apr, 2019 10:00 (GMT+8). ✦ XZC withdrawal & trading opens: 16th Apr, 2019 10:00 (GMT+8). Zcoin (XZC) is an open source, decentralized privacy coin that focuses on achieving privacy and anonymity for its users while transacting on the blockchain. It is the first full implementation of the Zerocoin Protocol, which allows users to have complete privacy over their transactions via zero-knowledge cryptographic proofs. Zcoin was also the first coin to implement Merkle Tree Proofs on its network for egalitarian mining, as well as the Dandelion protocol which protects user identities by obscuring their IP addresses.